Learned at the last minute that The Tech museum across the street from the hotel I’m staying at in San Jose is opened later than I thought. Spurred through just one floor there in 30 minutes and found even that limited glimpse very cool. Cleanrooms for chipmaking, multi-G robots, hands-on 3D rendering stations for a roller-coaster ride that you can then experience in virtual form and so forth. Silicon Valley in a condensed, playful form. Presentation-wise they do one thing that I have never seen in any museum. Many of the exhibits are equipped with a bar code scanner. You pass by, or rather interact with what’s on display and in the process scan the code on your ticket. And afterwards some output of your experience is available online at My TheTech. You can use the demo account to peek inside, or use my ticket code 0000001504656457. 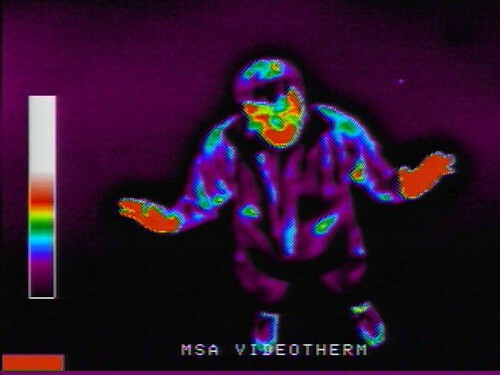 Sad that my 3D headscan got messed up, but the thermal portrait (above) is cool (except for face & palms) enough.